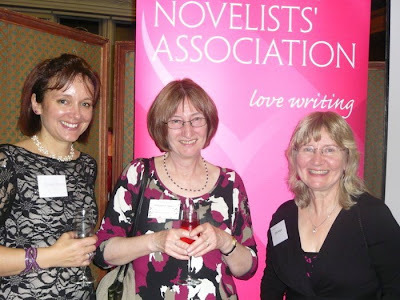 Exeter Writers Margaret James, Sophie Duffy and Cathie Hartigan went the Romantic Novelists' Association Winter Party in London last week. It was a very sparkly occasion held in the library of the Institution of Mechanical Engineers, Birdcage Walk. Much smiling, nodding and important networking took place, wine was drunk and unsuitable shoes put up with for the duration. Katie Fforde, President of the RNA, couldn't have been more delighted to meet Sophie. Katie had judged Sophie's novel The Generation Game to be a worthy winner of the Yeovil Novel Prize and she was thrilled to hear that the novel had been published to such acclaim. See also Creative Writing Matters.